Rescue workers scrambled to save 83 people trapped in Russia's largest underground coal mine after two explosions killed at least 12 people and injured dozens more, officials said. Among those still trapped early Monday were rescue workers who had entered the Siberian mine after the first blast. A high level of methane gas after Sunday's second, more powerful blast raised fears of further explosions and prevented more rescuers from going into the mine for the rest of the day. Only early Monday was the first rescue team sent down to try to bring out five miners whose location had been established, said Valery Korchagin, a spokesman for the Emergency Ministry. It was not clear, however, whether the miners were still alive, he said. The second explosion destroyed the main air shaft and all of the mine's above-ground structures, the governor of the Siberian region of Kemerovo told Prime Minister Vladimir Putin during a meeting with emergency officials, according to a government transcript. 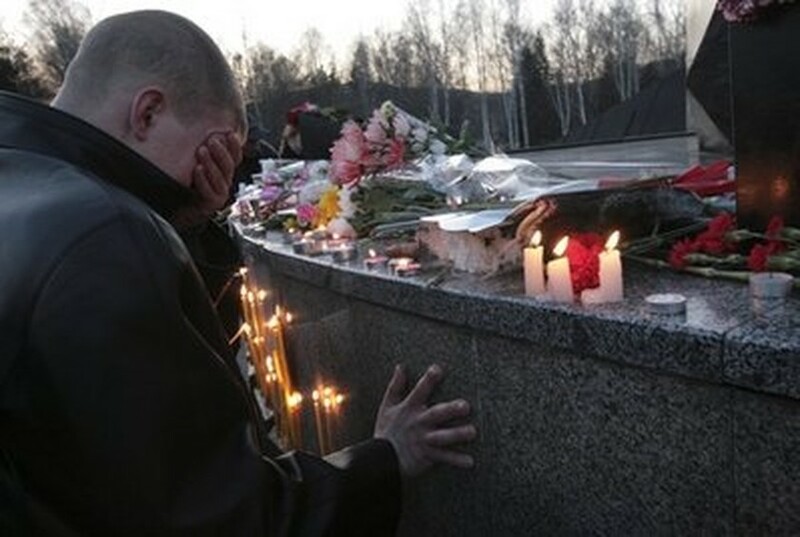 A man cries near a monument to the perished miners with candles lit in memory of the victims of the recent Raspadskaya mine explosions, in the city of Mezhdurechensk, in the west Siberian region of Kemerovo, Sunday, May 9, 2010. More than 500 emergency workers from around the country struggled throughout the day to ventilate the mine and rebuild mine shafts so the search for those trapped could resume, Korchagin said by telephone from Kemerovo, about 2,000 miles (3,000 kilometers) east of Moscow. By late Sunday, it was still too dangerous to enter the mine because of high levels of methane gas, said Emergency Minister Sergei Shoigu, who flew to the scene from Moscow to take charge of the operation. "Now we have to do everything possible to avoid a third explosion," the state news agency RIA Novosti quoted him as telling miners' families. Shoigu said emergency workers had identified two areas where those trapped were most likely to be and promised to send in rescuers as soon as an opportunity appeared. The first blast, believed to have been caused by methane, hit the Raspadskaya mine just before midnight Saturday and the second about 3 1/2 hours later. There were 359 workers below ground at the time of the first explosion, the Emergency Ministry said. A total of 58 people were injured. Most managed to get out, but after the second blast, 64 miners and 19 rescue workers were trapped underground and all communication with them was lost, Shoigu said earlier during the meeting with Putin, parts of which were televised. "It's clear the situation is difficult," Putin said "We could even say very difficult, tragic. Dozens of people remain in the mine. ... Their fate is unknown. And the saddest thing is that additional rescuers cannot be sent into the mine right away." He ordered emergency workers to use all means available to ventilate the mine as quickly as possible. The mine is 500 meters deep and has 370 kilometers (220 miles) of underground tunnels, said Aman Tuleyev, the Kemerovo governor. The Raspadskaya mine produces about 8 million tons (8.8 million short tons) of coal a year, according to the company's website. There was no immediate information on what set off the blast. Mine explosions and other industrial accidents are common in Russia and other former Soviet republics, and are often blamed on inadequate implementation of safety precautions by companies or by workers themselves. In December, nine people were killed in an explosion at an iron-ore mine in the Urals Mountains region that was blamed on faulty transportation of explosives. The deadliest explosion in Russia's coal mines in decades occurred in March 2007, when 110 miners were killed in Kemerovo. The United States was hit with its worst coal mining disaster in 40 years when 29 miners died April 5 in an explosion at a West Virginia mine. In China, where the mining industry is the world's deadliest, at least 33 miners died after a mine flooded on March 28. The flood trapped 153 miners, but most were eventually rescued.